Interviews with conference presenters, yoga teachers, sponsors and other members of the Northwest Yoga Conference community. 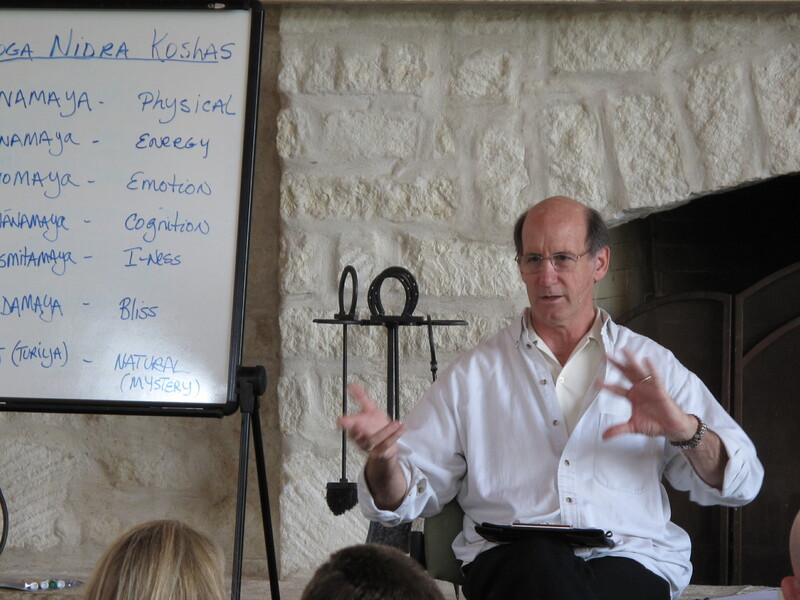 Richard Miller, Ph.D., is a clinical psychologist, yogic scholar, spiritual teacher, and the keynote speaker for this year’s conference. He has devoted his life and work to integrating the nondual wisdom teachings of Yoga, Tantra, Advaita, Taoism, and Buddhism with Western psychology. 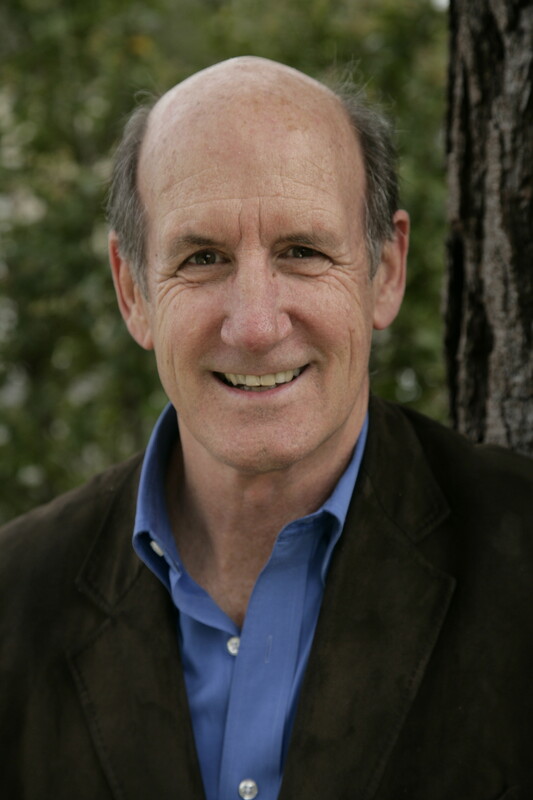 I had the privilege of speaking with Richard by phone last week, to learn a little more about his practice of Integrative Restoration, or iRest meditation, a modern adaptation of the ancient practice of Yoga Nidra. What is iRest, and how did it come to be? I was introduced to the practice of Yoga Nidra in 1970 and explored it over the decades with the help of many extraordinary teachings and teachers, including Swami Satchidananda, Stephen Chang, TKV Desikachar, and Jean Klein. As I became deeply involved in the practice, I began to develop it as a secular practice so that people in a wide variety of settings (such as homeless shelters) could receive these teachings. When I began to work with the military in 2004, they asked me to change the name. They said, “We’re military, we don’t do yoga.” So I came up with “Integrative Restoration,” because the practice helps us to integrate our emotions, thoughts, and psychology, as well as restore us to our true wellness as human beings. I call it “iRest” for short, because the practice also helps to relax the “I,” the ego; it returns the ego-I to its correct position, as one function among many, rather than as a predominant thought. Is iRest strictly a form of meditation? Dr. Miller leads an iRest meditation. I view the practice as a comprehensive path of meditation that helps us awaken to who we truly are, in all aspects: emotional, cognitive, psychological, and spiritual. 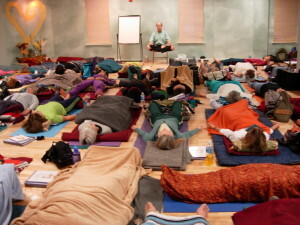 At the Northwest Yoga Conference, I’ll be showcasing a number of different practices (Yoga Nidra, body sensing, breathing, working with our thoughts) as a comprehensive way to live our lives, in all of our interactions with ourselves and with the world. What are some of your latest areas of iRest research? I’ve consulted on a variety of studies that show how iRest supports well-being. For instance, a study has just completed showing how iRest enhances the relationships of couples in the military. We’re also completing a study in Washington, DC with the Veterans Administration on the integration of iRest with acupuncture to relieve chronic pain. I’m also working with a medical doctor to develop research on the use of Yoga Nidra as a non-pharmacological solution for sleep-related issues. We have also studied its application to trauma—addressing PTSD, TBI, and chronic pain in veterans, as well as with survivors of sexual abuse. In all, we have completed over 20 studies to date, and iRest has shown extraordinary results across the board. After completing an iRest training, what kinds of changes have teachers experienced? In the Western world, Yoga has become associated with Hatha yoga, the physical practice. But we know that the teachings of yoga are vast and broad. Yoga Nidra helps keep us in the domain of Yoga’s comprehensive offerings of physical, psychological, and spiritual teachings. 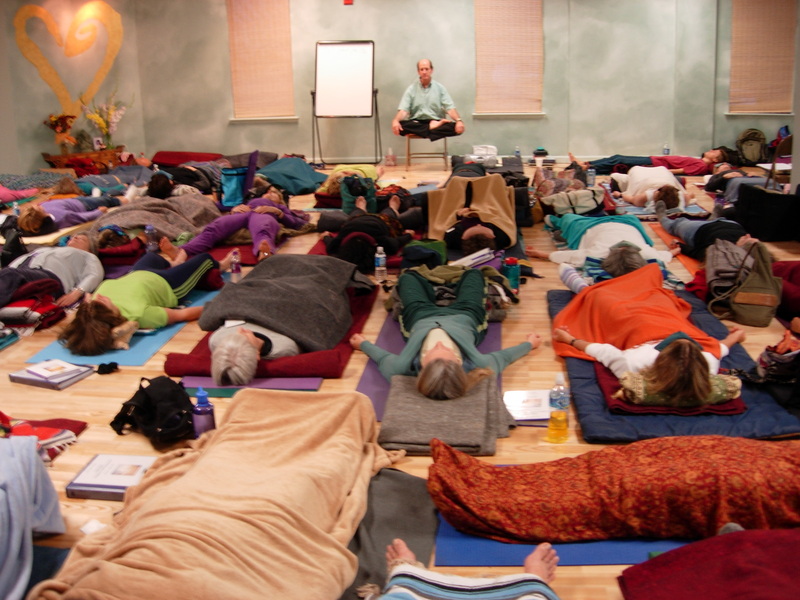 The way I present Yoga Nidra gives teachers a framework for understanding this comprehensive body of yogic teachings. I have developed a 38-stage “map” for meditation that encompasses the practice of Yoga Nidra, which I will be sharing at the conference. Every teaching of Yoga—whether it’s Hatha, pranayama, or meditation—can be assigned to one of those 38 steps. This gives teachers a better understanding of how they can teach to individual students or groups. You will also be teaching a workshop on Mindful Movement, or Source Yoga. How does this differ from a typical Hatha practice? Yoga isn’t a form of inner competition … it’s teaches us how to be, and be at home with ourselves. How would you describe nondualism in a nutshell? How did you first discover these teachings? The core principle of nondualism is that within ourselves is an essential essence of being that’s already healthy and whole, that isn’t in need of healing, that can never be harmed, hurt, or destroyed. When teaching nondualism, I introduce this core principle or final teaching first. Some people are ready to hear the good news; and then I teach them how to integrate this understanding into their daily life. Others aren’t ready, and so I give progressive teachings that help unfold this understanding. But in every moment, I’m always trying to showcase this final teaching. You can recognize this principle in every spiritual tradition: in contemplative Judeo-Christian teachings, Taoism, Buddhism, Yoga (Advaita, Kashmir), Sufism… there isn’t a spiritual tradition in the world that doesn’t have nondualism as a core aspect. But people often can’t grasp it. It’s a diamond that is offered to us, but we don’t see it. So we put it in our pocket or throw it on the ground, looking for something else. The mind is used to complexity, but this understanding is radically simple. Jean Klein is the teacher who brought this home to me. He took all of the teachings that I’d received up to my first meeting with him, wove them all together, and helped me integrate them into this final understanding. Jean was my “sat” guru, the teacher who helped me realize my essential nondual nature. What do you hope to share with conference-goers? 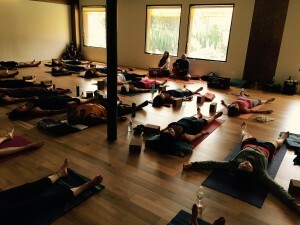 One comment I often hear from veterans, when using Yoga Nidra to work with deployment trauma, is: “I feel like I just came home.” The practices of Yoga Nidra bring us back home to ourselves. And then, these same teachings help us, in every moment, live from our true “home” as we move in the world. My desire is to help everyone I meet have this immediacy of insight. Not at the cognitive level, but at the heart level—a recognition of who they truly are. That’s my intention and my heartfelt desire in sharing these precious teachings that have been so instrumental in my own life. I’m paying forward what I’ve been so fortunate to have received during my life. Annie Carpenter has spent the past four decades devoted to the practice and teaching of yoga and dance. She is an internationally renowned teacher based in the San Francisco Bay area where she teaches SmartFlow yoga. 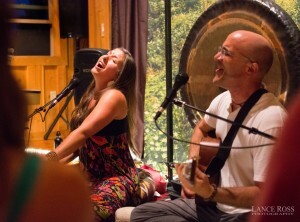 She also leads 200 and 500-hour teacher trainings at Exhale in Venice Beach, CA. 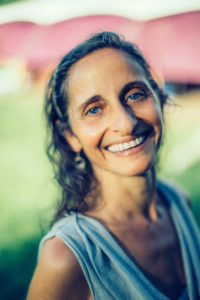 Annie is known as a teacher’s teacher, with a keen eye for alignment in the context of Vinyasa Flow blended with a dedication to the meditative qualities of yoga. 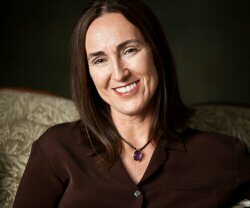 Annie will be teaching a variety of workshops at the conference, including a day-long therapeutic intensive on Thursday, March 5. I had the chance to chat with Annie via email before she left to lead a retreat in Nicaragua with her friend and long-time colleague, Maty Ezraty. You will be teaching an all-day Therapeutics intensive at the conference. What brought you to study yoga in a therapeutic context? And why should flow teachers (or any Hatha Yoga teacher) gain knowledge of therapeutics?Frankly, ALL yoga should be in by definition, therapeutic! Which simply implies that a level of attentiveness is present during the practice so that each act one makes in a practice, whether the way one breathes, or sits or moves from pose to pose is enhancing well-being and the understanding of being wakefully alive and how each of us fits into the miraculous web of life. Specifically, having spent 4 decades practicing and teaching (and all of the structural study), I have witnessed how practices helps and how it doesn’t. I have felt in my body and mind how change happens over the years via aging and the shifting of life circumstances (joy of new relationships, children; grief of loss of loved ones; illness and pain; etc.) creates conditions which needs must alter how to practice. As Sharon Salzberg says about a daily meditation practice (I paraphrase), “practice today so that it’s there when you need it.” If we can create a practice that is — as you say, strong flow — when we are young, healthy and free of distress that is awesome. And if we can create an attitude and a knowledge of how and when to alter the practice as needed depending on shifting circumstances, then we have a practice for life. Our own, and our students’. You have been practicing and studying yoga for the majority of your life. What inspires you these days to get to your mat or the meditation cushion? The fact that I ALWAYS feel better after I practice. As you know, there’s a lot of Vinyasa, or Flow yoga, available to Western yoga practitioners. What makes your style of yoga, SmartFLOW, different from any other style of Vinyasa or Flow practice? SmartFlow is a method which sets up the conditions for each student to discover HOW to practice in every moment of their practice. In each pose, in each breath, we offer a continuum of exploration that is at once highly specific and open to individual choice. This leads to a heightened awareness that is structurally sound for each practitioner, and invites the practice of being a witness. Through this capacity to step back and observe the choices one makes moment to moment, and more importantly how and with what attitude, we create a practice that is rigorous and compassionate, passionate and patient. You are offering a pranayama session and a restoratives session at the conference. How do you find these practices help balance students, especially those of us (myself included) who tend to find ourselves typically practicing strong flow? I caught up with Jeanne Heileman on a day when things were not going as planned. Her retreat partner had a change in plans, and she was unexpectedly left to set up and lead an intro session on her own, right after teaching a yoga class. When I called, Jeanne graciously agreed to do go ahead with our interview, despite being in the midst of a last-minute trip for supplies before the evening events began. You have studied many forms of yoga—including Ashtanga, Iyengar, Vini, and Tantra—and with some of the country’s most renowned teachers. Could you talk about one experience that has had a significant impact on your practice? I would have to say it was when I started to study Tantra with Rod Stryker. That’s when I realized that all of the joy and excitement I got from working on the physical level could also be found by working internally. As a Sting fan, I have to admit that when I hear “Tantra,” the first thing I think of is … not yoga. What does it really mean? It’s not what people think. When I think of Tantra, I think of embracing every aspect of my life, the difficulties as well as the joys, and seeing it all as part of my yoga practice. Every moment of my day, I am trying to live as a yogi … being stuck in traffic, finding out I have to manage this info session by myself, lack of sleep, body aching … all of these things. It’s about reminding myself in each moment: Okay, this is surrender. You’re not breathing enough. Use your mantra. In these moments of difficulty, I call on the Yoga Sutras. I ask myself, am I going to believe all the thoughts in my mind? Or am I going to watch them? Sometimes life throws us a little test with the challenges: How’s your yoga doing today? The quality of my mind is the mirror that shows how well my practice is going. This is living the yoga; this is the practice. Is this an aspect of yoga that you think is often overlooked in the U.S.? When I started to study with Rod, I had just gone back to acting … and I realized I actually could do both. I didn’t have to pick one. That was so liberating! The practices and exercises we did also helped me to realize, I am always doing yoga. I’m doing yoga right now, having a conversation with someone while trying to remember what I need at the grocery store, and hoping to get to the studio in time for my class. Or as I’m sitting and trying to meditate and my body is aching and I want to cry … that’s it, too. The question is, can I accept it, whatever “it” is? When I do surrender to this … there’s usually some amazing shift. It’s like you can feel a loving caress from the Divine Mother. Yes! Although it was more like I discovered joy, because I don’t know that I ever had it before. Except maybe through coffee. What are some things you keep in mind when putting together a sequence for a class? I use a lot of principles from Ayurveda. For example, the weather is really Vata right now, so I’m going to sequence differently than if it was hot and full of Pitta energy. I also adjust my sequencing based on the time of the day. Jeanne radiates joy while leading a class. I might keep to a similar shape throughout a sequence, to help someone go even further and deeper toward a goal, a peak pose. I also take into consideration who is coming and what is going on in the external environment: politics, financial markets, world events, as well as the state of mind/energy of the students. In any case, I’m always thinking about affecting energy. It’s not just pose, pose, pose … what I have learned from Rod, in Tantra, is that we want to help the person remember their luminous essence. Do we want to increase that person’s energy, or bring it down and help them calm? I look at where they are and where they need to go to reconnect to their Center. In my conference workshop [Creative Sequencing that Makes Sense], we will actually sequence a class together, considering various options. If someone doesn’t know about Ayurveda, that’s fine—I’ll cover some of that so that they can follow. Even if you’re not a yoga teacher, it’s fine. This is useful for home practice, too. I saw on your website that you struggle with scoliosis. How does your own experience of chronic pain affect how you work with students? Once you have any sort of pain, if it’s really good and juicy, I think it opens you up to your compassion, to realizing that other people are in pain too. As I walk down the sidewalk or drive on the freeway, I look in windows and think, “I wonder who else is in pain?” You realize that everyone’s pain is different, yet the same: it’s hard to breathe, you want to cry and give up, etc. Helping a student with an adjustment. When I have a student who has an injury, I’ll ask them to describe it. I’ll try to put myself into their pain because it helps me to understand what’s happening for them and discover what they need. 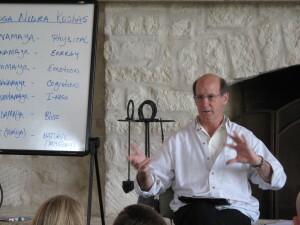 At the conference, one of your workshops is a “Closer Look” at the Bhagavad Gita. For those of us who have not studied that text deeply, what is something that we might find surprising? The book is just pure love! 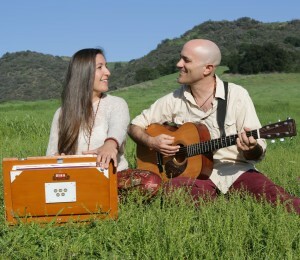 It’s about how to give and receive love, and how to be a yogi in the present world. People should know that even if they don’t know the book, if they haven’t looked at it, they can come to the workshop. A lot of people think it’s going to be heady and difficult to read, like Shakespeare … but it’s so accessible and so beautiful. I will break it down in a way that people can really relate it to this present day and time. Students who take this workshop leave loving the experience, and the Gita. I am really honored to be part of this conference and have this opportunity to share not only asana, but these other aspects of yoga. What advice do you have for a new student of yoga like myself? I used to teach new students … they would take a class or two and then ask what they should do, and I would say, “Promise me that you will come once a week for 6 months.” And they would say “Sure, of course” … but it’s the holidays, things happen. Stay with once a week no matter what. If you have the time and energy, by all means do more, but never drop any lower than once a week. Then try to appreciate the experiences happening inside your body—not what’s happening on the outside, how it looks, or whether you’re hitting the pose just right. Let the yoga do its job. Don’t you do yoga, let the yoga do you. The rest will unfold as is necessary. When talking with Melanie Farmer—whose Pioneer Square practice is a blend of yoga, Ayurveda, Jyotish, and massage—you cannot forget for a moment that these practices trace back 5,000 years. But even more remarkable than the depth of her respect for ancient wisdom is how deftly she applies it to every aspect of modern reality, from household clutter to holiday stress. How would you explain the relationship between yoga and Ayurveda? Ayurveda is an approach to health and well-being that has to do with how you balance your own needs and heal yourself so that you can be of service to your family and community. I use the word “yoga” as a verb. Yoga involves taking theories of self-care and actually putting them into action. So in addition to the asanas, for example, understanding your dietary needs and eating well is also a form of yoga. For those of us who are practicing or teaching yoga but not incorporating Ayurveda, are we missing out on the bigger picture? What I have found is that if people stick with it long enough, they eventually figure it out. Even the word itself, “yoga” … that’s an ancient Sanskrit word. It’s been the same for 5,000 years. So just by saying it, you are invoking a tremendous energy and power. I have great faith in the practices and the nature of yoga. People find their path. These ancient practices are bigger than we are. As a new student of yoga, I find that very comforting! Right. As a new student, it doesn’t matter where you start. It’s about trusting yourself and the way that you’ve been called to yoga. There may be fits and starts, times when despair can be great, even—despair is a very deep, important aspect of yoga. But there’s no going back. What is one experience that has had an impact on your own practice? Melanie teaches a class at her studio. A turning point for me was when I sustained a very serious back injury. It was really a culmination of everything … being too aggressive with my asanas, not nourishing myself enough, not allowing myself enough rest. I had a son, I was married, I owned a business, I had my training … so I lived with a herniated disc in my lower back for years, trying to heal while continuing to work and teach a full schedule. Finally, the physical therapists and my doctor said, “Enough. You need to stop. It’s time for surgery.” And I was ready for it. For a time, I could do almost no asana at all. From this has come a shift away from being so aggressive … It was a good lesson. My practice now is much more about self-care. How has that changed you as a teacher? Almost everyone who has practiced for any length of time has experienced some kind of injury. Out of that will come lessons around self-care, ego, and our own vulnerability. If we understand it well, we become better teachers. We are better able to help our students avoid that kind of difficulty and pain. It’s important to trust yourself and your body. If your teacher is mature in their own practice, when you say, “No, that doesn’t feel right,” they will accept that, and they will respect you for it. They will offer you another option. At the conference, you’re teaching a workshop on Marmas and Adjustments. What are the marmas, and how can they benefit teachers and students? A marma is a vulnerable point in the body, where you have a number of different tissue structures coming together: for example, the spine, the elbow, the knee. These are the same points used in Kalari, an ancient form of martial arts, as well as in healing systems like acupuncture. When teachers are adjusting, the natural places to position the hand just happen to be where the large marmas are. If we understand this, then an adjustment becomes more than just a hand placement. You understand that you’re touching something more vulnerable—and at the same time, more powerful—than what’s at the surface. Another one of your workshops is about creating a supportive work and home environment. What are some of the things you’ve done to create your own personal “haven” at home? This workshop comes from understanding the connection between Ayurveda and Vastu. Vastu teaches us that our homes and rooms are like the bodies that we live in. We want these spaces to be balanced, just as we balance our physical bodies. If your home is not balanced, you can’t be balanced. There are some really fundamental practices that can help. At a basic level, you can look at things like clutter and cleanliness. If you have a lot of things that you don’t need or don’t love– get rid of that stuff. Keep a very simple home environment. Recognize that things are energy. I live on Vashon, in a little cabin … over the past year I have gotten down to just a few things that I really care about. But it’s been a gradual process. I appreciate the things I have for how they have served me, and then I feel happy to give them away so that they may serve someone else. As we authentically let go, there’s a moksha (freedom). But we can be compassionate with ourselves in the process. There’s no rush; just be ready to let go. For some of us, the holidays can be a stressful time. Any self-care tips? The holidays are about wanting to be with people you really love and want to be with, and who love and want to be with you. For many people, this may mean you need to look at the nature of your interaction with certain family members. If you’re starting to feel stressed or anxious, what are you going to do for yourself? Can you limit the amount of time you spend in those family situations, so that you have more time to spend with others? Wow. I was hoping you were just going to tell me what foods to eat! If only it were that easy, right? The holidays are so often about going back into the family dynamic and playing out those old roles. Unless we recognize what’s happening, it’s going to feel bad. But when you recognize this, the food issues tend to go away, because you’re not doing the emotional eating. You won’t want to eat those unhealthy foods once you address the core issues and nourish yourself with good, healthy boundaries. 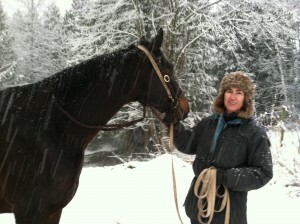 Speaking of relationships … You have a special one with your retired racehorse, Cooper. How has that experience changed you? We talk a lot about heart opening in yoga, in posture practice. With Cooper, I am learning at a deep level what it means to open my heart. The vulnerability is great, if we really respect an animal. Cooper has experienced human beings who were violent, and he has a huge heart. I’m trying to have this very subtle communication with him so that he can have what he wants, even if it’s not this training we’re doing together, which—as gentle and respectful as it is—is triggering his posttraumatic stress. At times I’m not even sure he wants to stay in this world. As this stress comes up for him, I have to look at what’s coming up for me: I have to work with my own heart in these moments of fear, anger, and grief. In the end, it’s really about opening your heart with no agenda at all. That is what’s being demanded of me in this relationship. And that’s the yoga. That’s the spiritual work. It is well-documented through past interviews that you were originally on a career path towards Hollywood and acting when you diverted over to teaching yoga as a career path. 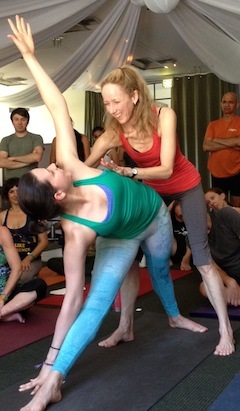 Do you find overlap in the skills you were developing and honing for acting and the ones you now use as a yoga teacher? My theatrical training has helped immensely. There are many ingredients that go into being a good teacher, but the theatrical background helps me be strong in front of large groups and to hold their attention. I like to believe everything happens for a reason, so I think my acting background helped make me stronger as a teacher. As small business owners, my husband and I are always fascinated by when a person or business “makes it big.” Looking back now, can you see where the “breakthroughs” were for your career as a yoga teacher? What were the major turning points for your yoga career? Hands down the most important component was my training. I was lucky enough to train under Maty Ezraty, one of the best teachers in the world. It doesn’t matter how talented you are at asana if you don’t have the skills to back it up. Maty is a magician. I was lucky enough to shoot with Yoga Journal early in my career, which helped get my image and name into the mainstream. ToeSox created quite the dramatic stir, which was unexpected but ultimately useful. My undergrad studies in English helped as I began to write and blog regularly and injected my voice into some mainstream publications. Ultimately, it’s a long list of events backed with a lot of drive and belief in myself. Your dad has been incredibly successful in many realms. What influence has he had on how you approach the business side of your career? I watched my dad achieve anything he put his mind to. He has been the president of three universities. He’s always been incredibly passionate about baseball, and before I knew it, we were leaving Kansas for the east coast because my dad had became the President of the American League of Baseball. Watching him live his dreams made me think anything is possible when you stay true and apply yourself. I’m so grateful for those lessons. What three traits do you feel contribute the most to your success? My ability to aim true, my accessibility and my playfulness/honesty. You are a well-endorsed yoga teacher and public figure sponsored or endorsed by many companies – ZICO Coconut Water, Under Armour, ToeSox and Women’s Health, to name a few. In my opinion, you broke new territory. Does it feel surreal at times? Totally surreal. I’m honored to work with the amazing companies that I do. It’s amazing to see yoga going mainstream and being respected by heavy hitting companies. It’s quite the ride to get to represent yoga on such a level. How do you manage your social media without your social media managing you? Ha! Good question. Honestly, I’ve always really enjoyed social media. I was very artistic when I was younger and feel like social media is this great platform to collage your ideas and inspirations. Granted, the more followers I’ve garnered, the nastier the comments I’ve received. That’s the shadow side but also a good lesson in that not everyone is going to love you and that is absolutely fine. Keep doing what you’re good at, what you love, and don’t let anyone drag you down. I have had the pleasure of working with your assistant, Taylor. For those yoga teachers who have an assistant, it’s not always easy to find a good fit for an assistant. What advice can you offer to finding a good fit? It is incredibly hard to find a good assistant and Taylor is a total godsend. You need to find someone who is not only incredibly organized, but driven, and that you can trust with all of your personal information. Also, that someone has to be really good at being your ‘voice.’ Taylor happened to be a best friend who saw me struggling in between assistants and stepped up to bat. I’m so grateful for that. You travel the globe pretty much every weekend teaching yoga. How do you proactively prevent teaching burnout? My students keep me inspired and honest. All I need is to see the excitement on their faces to keep me motivated. I owe it to my students to deliver the absolute best. This fall, you and Gina Caputo are offering a yoga teacher training. What can attendees expect from this training? I have a feeling it’s going to be pretty epic. Gina is one of the funniest, brightest women I’ve ever met and I’m so honored to collaborate with her. This TT will offer all the basics you need to be a great teacher, but we want to take it beyond the basics and really dig into what it takes – beyond the foundations. How to stand out in a sea of teachers, how to keep your aim true and your heart open, and how to succeed in what you love will be other focuses of ours. What can attendees at the Northwest Yoga Conference expect from your workshops? A really, really good time.